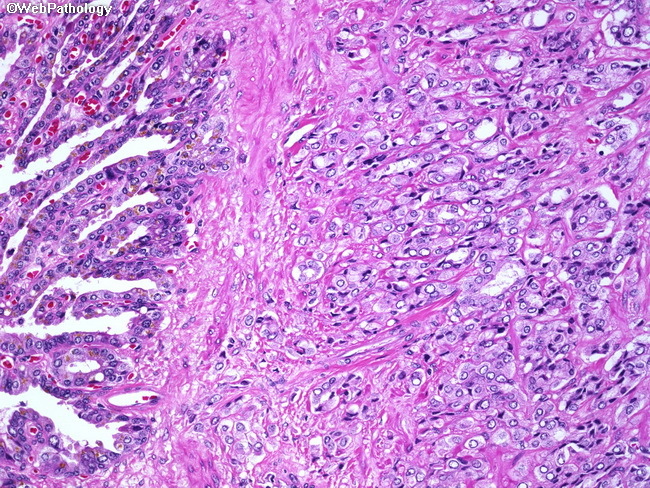 Prostatic adenocarcinoma (Gleason score 4+5=9) involving the muscular wall of the seminal vesicle. Besides invasion of the seminal vesicle from periprostatic soft tissue, the tumor may spread to seminal vesicles via ejaculatory ducts or by lymphovascular invasion. Note the sparing of the seminal vesicular epithelium.